Dark Alley Press, 9780692375730, 198pp. "There are some people that walk around on two feet and others like me that run on all four." To most people, that's a bold statement. I just wish I'd been the one to say it, but I wasn't. In fact, until a few days ago, I wasn't even sure what it meant. Either you're the type of person who lives within a set of boundaries or the type who knows none. No, I'd say that the most important insights about who we are, what we say, and why we do things are not always the obvious ones. Instead, they're discovered on the streets of your hometown, revealed late at night in a dark backroom, or sometimes forced upon you at knifepoint where your only choices for survival are between bad and worse. "The Art of Raising Hell is our generation's Catcher In The Rye: a tender, yet compelling, coming-of-age tale that reminds its audience of the difference between life and living." Laura Valvasori, The San Francisco Book Review. 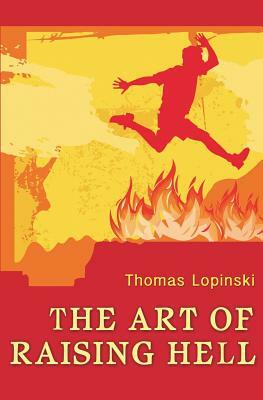 Thomas Lopinski grew up in a quaint small town in Illinois called Georgetown with one stoplight, one high school, one square, one lake, one police car, and one hundred ways to get into trouble. It was a wonderful place to be a child. He studied at the University of Illinois and later moved to Southern California with his wife and children to work in the music business. He is also a member of the Independent Writers of Southern California (IWOSC). His first novel, Document 512, won several awards and recognition in 2012-2013 from Readers View Reviewers Choice Awards, Best Indie Book Awards, IndieFab Awards and the National Indie Excellence Book Awards.